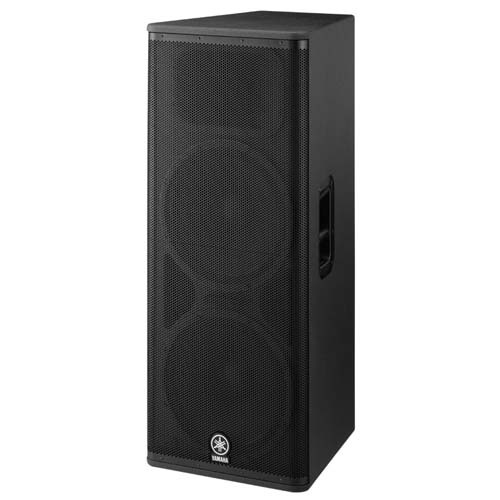 The Yamaha DSR215 Powered speaker is a 1300 watt powered dual 15″ 2 way speaker with advanced built in DSP. Yamaha has put in a lot of Research and Development dollars into these speakers and they feel they are some of the finest powered loudspeakers you can buy. The DSR215 comes with two 15″ Neodymium LF Driver with a 3″ Voice coil. The horn is a 2″” Titanium design with a Neo magnet. The cabinet is wooden with a Line-X coating to give ultimate durability. The power section 1300 watts with 850 watts for the LF Driver and 450 watts for the horn. The Max SPL level is a whopping 138 DB. All DSR speakers feature an advanced digital tuning technology called FIR-X. This technology optimizes frequency and phase response while adjusting the time alignment between the drivers at any volume. This means it sounds better at any listening volume than traditional speakers using an analog crossover network. All signals are processed using 24 bit A/D and D/A converters with high end specs. The DSR215 also has D-Contour technology which automatically adjusts the drivers levels depending on the volume of the speaker. So at all volumes individual frequencies are enhanced to achieve best sounding results. The amps are Class D digital and produce very little heat. No fans are necessary to keep the amps cooled so all that is needed is a convection type heat sink. The power supply is a switching mode design with PFC. PFC harmonizes the phases of the load current and basically make the speaker sound great even under severe conditions.